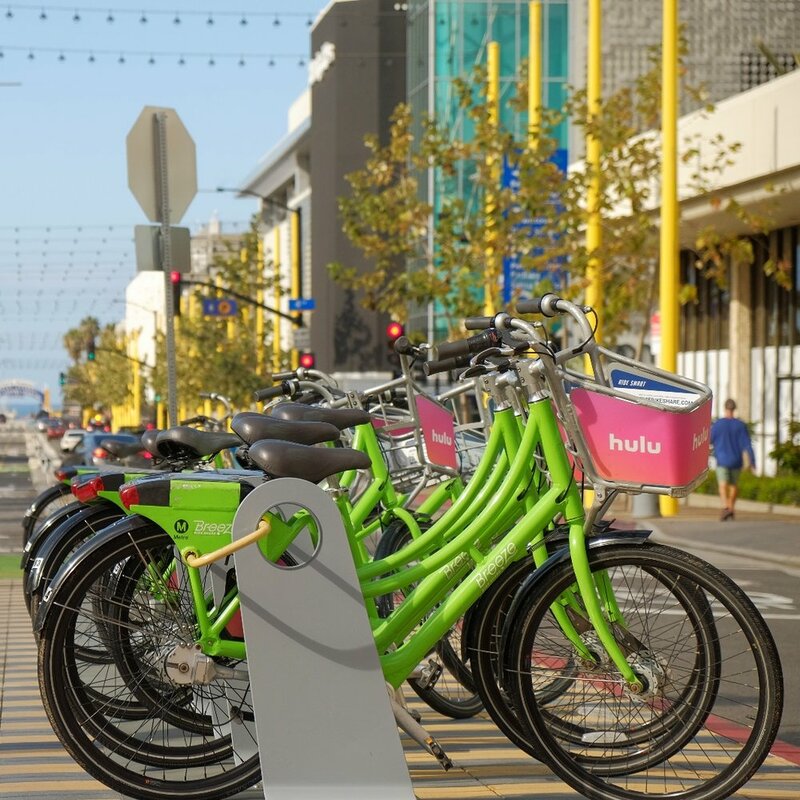 Few places have the reliable weather and scenery to compete with Santa Monica, and now that they’ve gotten serious about their bike infrastructure, you can connect all of their fabulous dots quite easily on a bike. 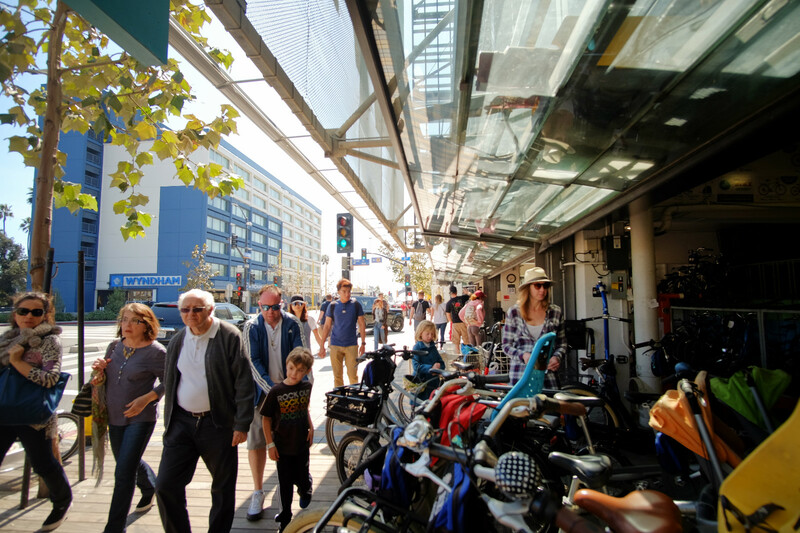 Our travel guide offers all the resources for you to plan your #WanderbyBike experience in Santa Monica. Places for Bikes City Rating: 3.2 out of 5. Comprehensive and holistic rating on ridership, safety, network, reach and acceleration. Compare this score to Boulder's at 3.4. Walk Score: 83. Walk Score measures the walkability of any address based on the distance to nearby places and pedestrian friendliness. Transit Score: 63. Transit Score measures how well a location is served by public transit based on the distance and type of nearby transit lines. Bike Score: 84. Bike Score measures whether an area is good for biking based on bike lanes and trails, hills, road connectivity, and destinations. Originally Santa Monica was just one of the many Catholic missionary towns along southern California’s southern coast, each separated by 1 day’s walk. Then it was a sleepy, not-at-all-hip northern suburb of Los Angeles. And finally the wealth and reach of LA engulfed it, creating a mix of older neighborhoods with small homes and corner stores, next to $25 taco plates and $300 haircuts (take it from us - check those prices before you book a haircut, folks). 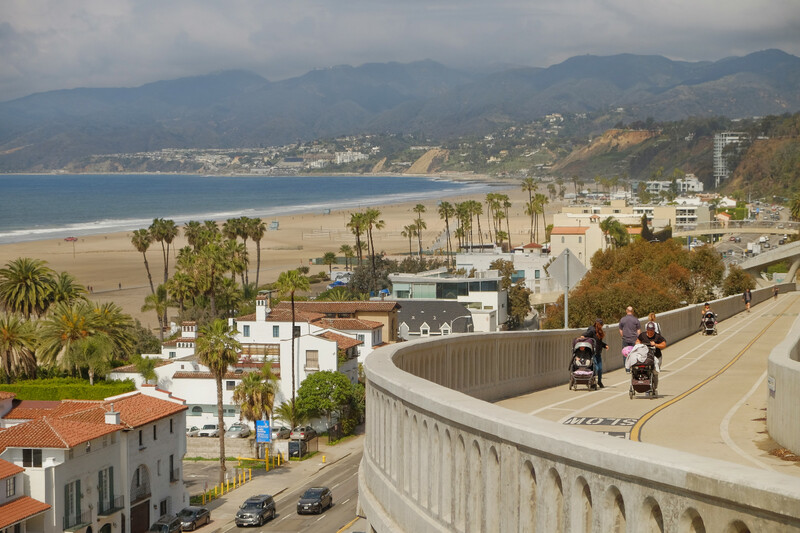 Santa Monica has both kinds of people in abundance… people biking to work or to class, and people in six-figure convertibles cruising up from LA for the day. Much of this interaction transpires under towering palms and larch trees, along wide, classic proper Californian boulevards. Down at the beach level, the scene is largely one of rental bikes being enjoyed, dogs being walked, and selfies being taken. The beach is a happy place. Huge swing sets, gymnastics rings, and other playground equipment on steroids line some stretches of the path, as well, which make for pleasant diversions. The town itself is up on a bluff overlooking the vast beaches – and we do mean vast. If you’re not familiar with southern California’s beaches, the sheer distance between the beginning of the beach sand and the eventual ocean waves can be shocking. 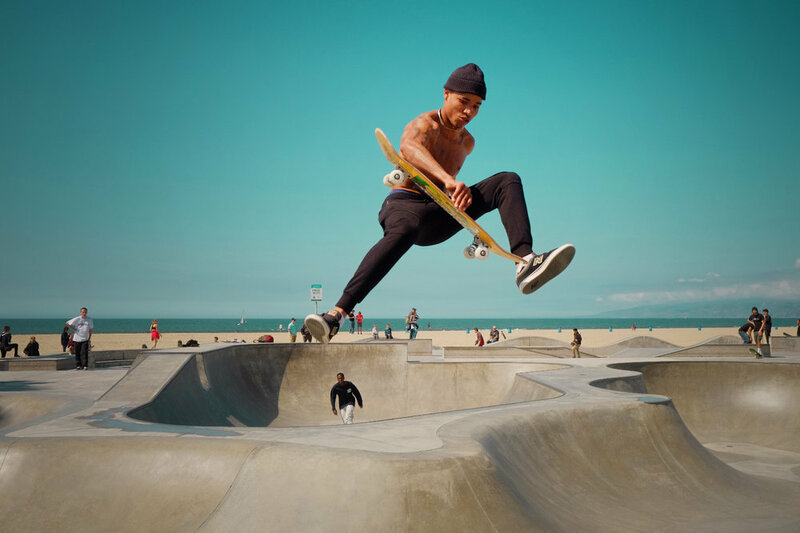 Cruising along those beaches, or rolling up around town, things are pretty much flat as a board. The only real climbing you’ll do is going from the beach back up to town, but the car-free concrete structure (California Incline) they’ve built to get you there is graded gently, so it doesn’t feel like much work. 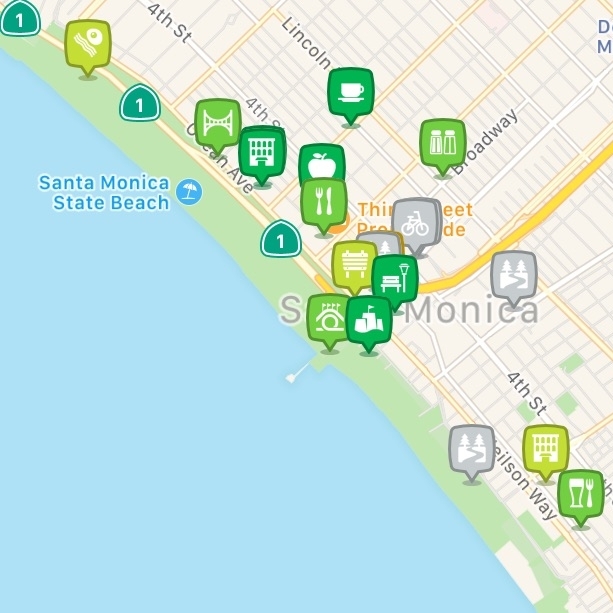 Thanks to the recent additions to their biking network, none of the biking around Santa Monica felt like work, really. Without having to worry much about cars or navigation, you’re free to take in your surroundings, which are famous for a reason. The resident bike commuters here are like those everywhere else… They know where they’re going, and they’re efficient about it without being overt or pushy. 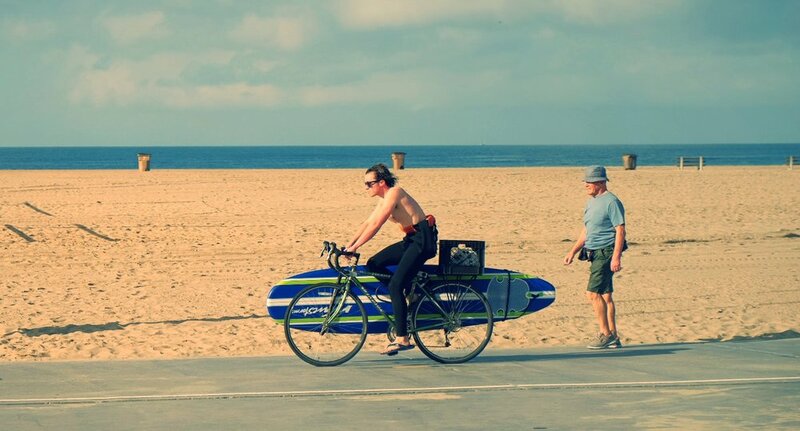 Meanwhile, the bike lanes around town and especially those on the beach will also be full of other tourists on rental bikes. You’ll likely see a higher concentration of casual bike tourists here than in other places you’ve visited. Some of those people haven’t ridden a bike in a long, long time, so when you come upon someone giving off that “haven’t done THIS in a while” vibe, be prepared to give a wide berth, pass with caution, and expect the unexpected. And hey - hopefully they enjoy themselves, and when they get home, they dust off that old hybrid in the garage. At night, a white front light is required, along with a rear red reflector and yellow or white reflectors on the pedals! Having said that, we saw plenty of non-conforming pedals around town, so… perhaps that one’s not enforced consistently. Perhaps. Helmets seem to be recommended but not required, so do what feels right to you. Some enterprising individual relieved our resident photographer of the nasty old grips off his Brompton, as well as a (branded!) handlebar bag off the rental bike we had, so we’re going to say the bike theft scene in Santa Monica is alive and well. You want my grimy, sweat-infused old grips that bad, my friend? You can have them. Bring your bike inside at night if you possibly can. If you absolutely can’t, then lock the bejeezus out of your bike AND wheels, and do so in a well-lit place in full view of God and everyone else. Our bikes were locked up behind our building in a covered parking structure, so learn from our mistakes. Locals are laid back, and used to dealing with tourists. In the city spaces, it seemed to be mostly locals bike commuting, many of them college students. On the beach, it’s mostly tourists, some of whom were on dockless e-scooters. We assume the presence of these scooters will only increase, and we had no trouble navigating among them. Their cruising speed was similar to ours, they don’t take up much space, and people riding them were no more or less courteous than anyone else. Ambassadors Needed! 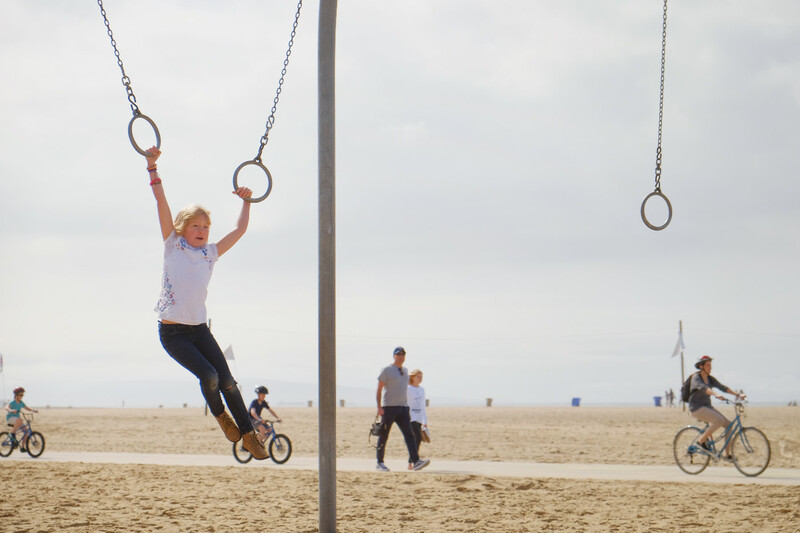 Live in Santa Monica and love food, music, art or just being outdoors? Curate a route for us by inquiring here. 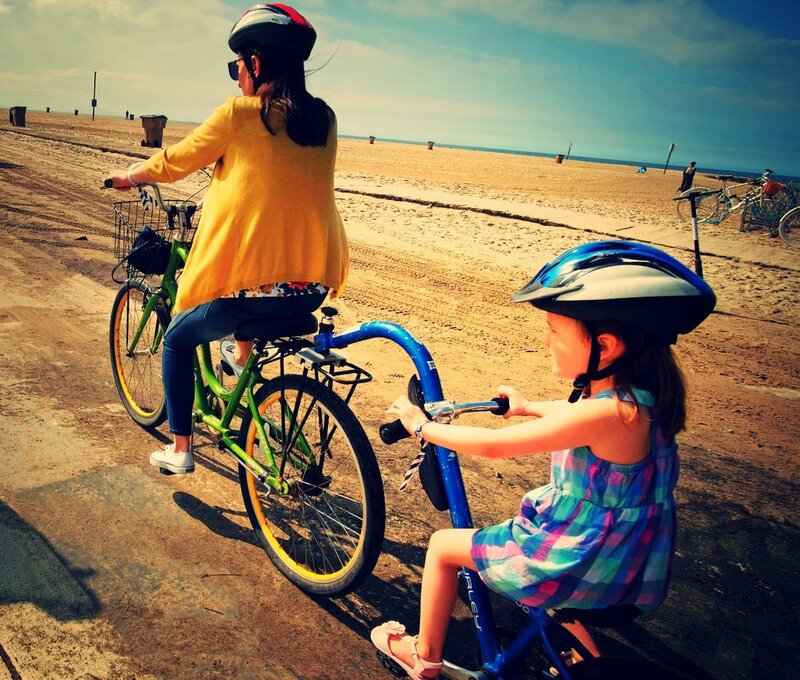 Santa Monica Bike Center - $20+ for 2 hours or more for comfort, city, road, tandem, electric, cargo, kid's bikes, kid's trailer bikes or kid's seats. Helmet and lock included in rental. 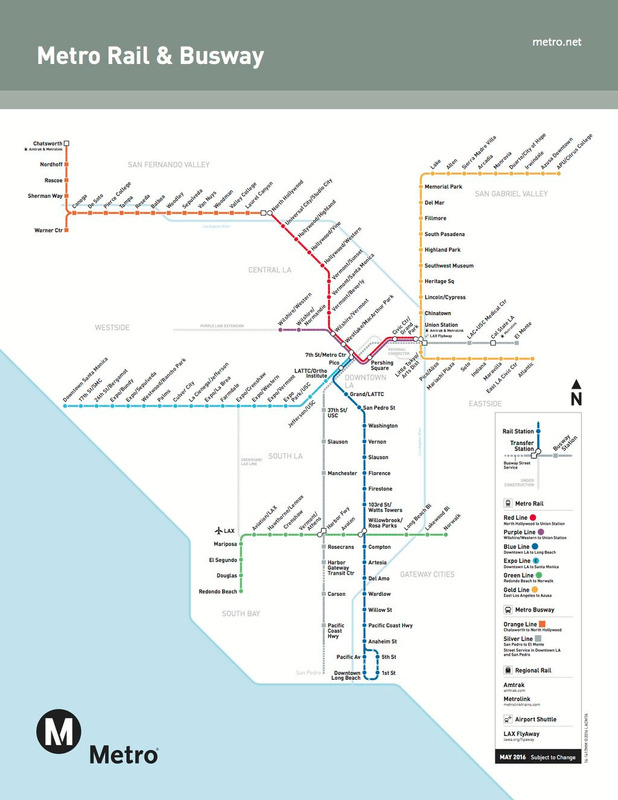 Metro (Map) - $1.25-1.75 one-way, $7 per day. "Bikes can be brought onto Metro buses and trains at all times, if space is available." Airport to Downtown - take the Big Blue bus from LAX Transit Center to Santa Monica. Coast Starlight (Seattle-Portland-Sacramento-Los Angeles) - $20 for trainside checked bicycle service. Reservation required. Southwest Chief (Chicago-Kansas City-Albuquerque-Flagstaff-Los Angeles) - $20 for trainside checked bicycle service. Reservation required. Sunset Limited (New Orleans-San Antonio-Tucson-Phoenix-Los Angeles) - $20 for trainside checked bicycle service. Reservation required. Sun Country- "Sun Country will accept non-motorized touring or racing bicycles with single seats. Bicycles must have the handlebars fixed sideways and the pedals removed, be placed in a cardboard container, or have the pedals and handlebars encased in plastic foam or similar material. The charge is $75 per bicycle on all flights." Bikabout donates 25% of annual revenue to local advocates. 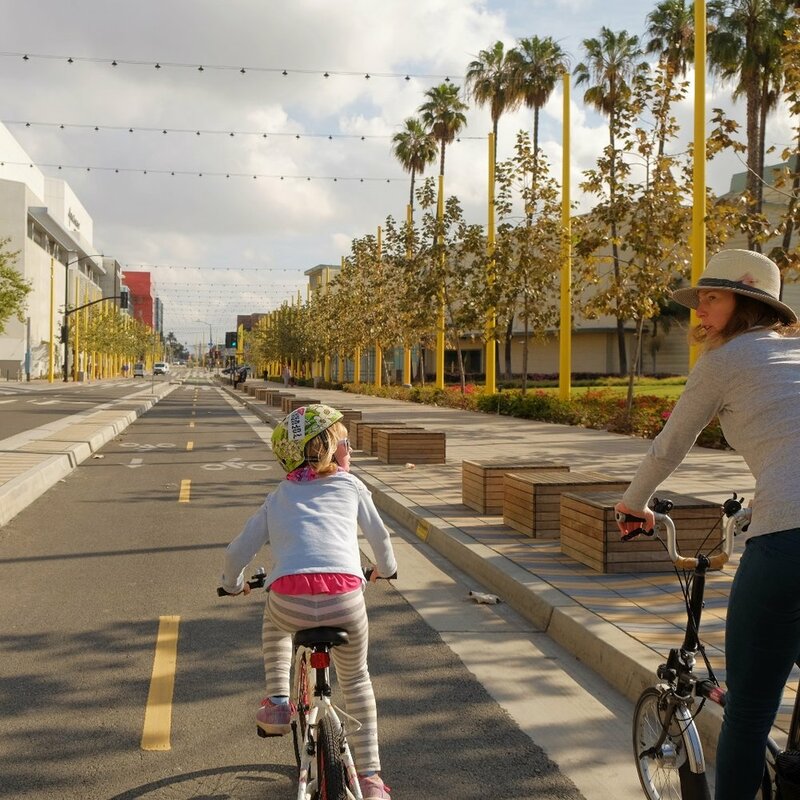 You, too, can power better biking in Santa Monica by donating to SM Spoke!